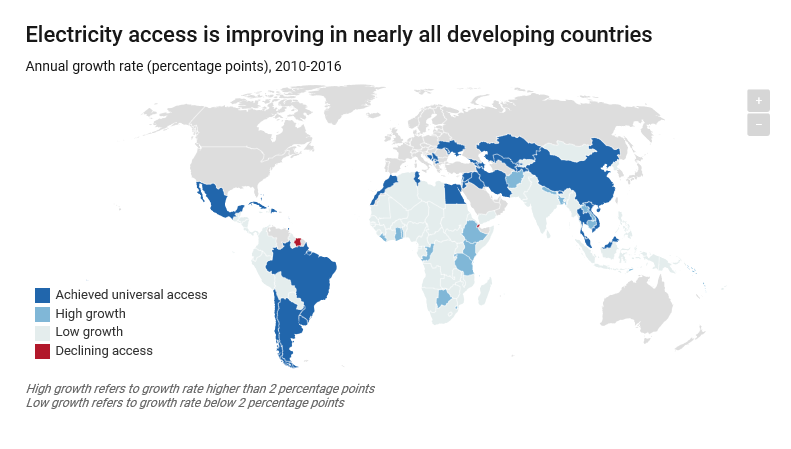 As 2018 came to a close, the World Bank highlighted 14 key charts that capture the global challenges that we face. These challenges affect the economic context, as well as trends that shape investments across the globe. At Newton, we have reviewed which of these charts are especially pertinent to investors. 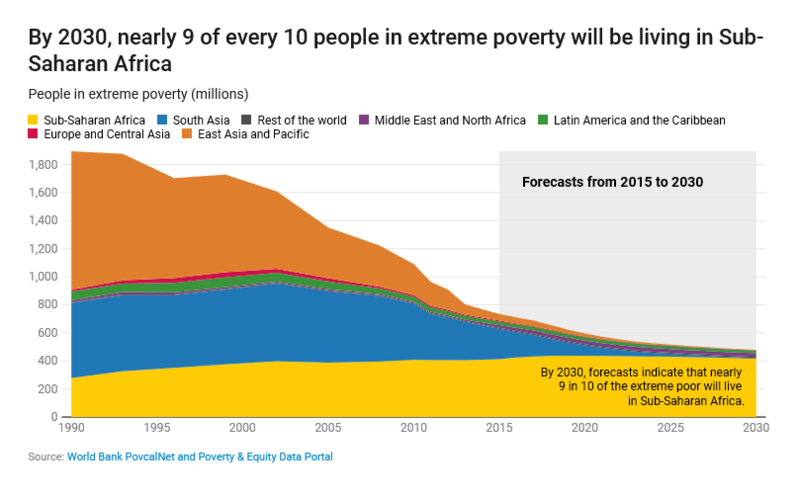 Contrary to the global trend, extreme poverty is increasing in Sub-Saharan Africa – there are more people in extreme poverty here than the rest of the world combined, with average poverty rates at 41%, which is well above the global average of 13%. 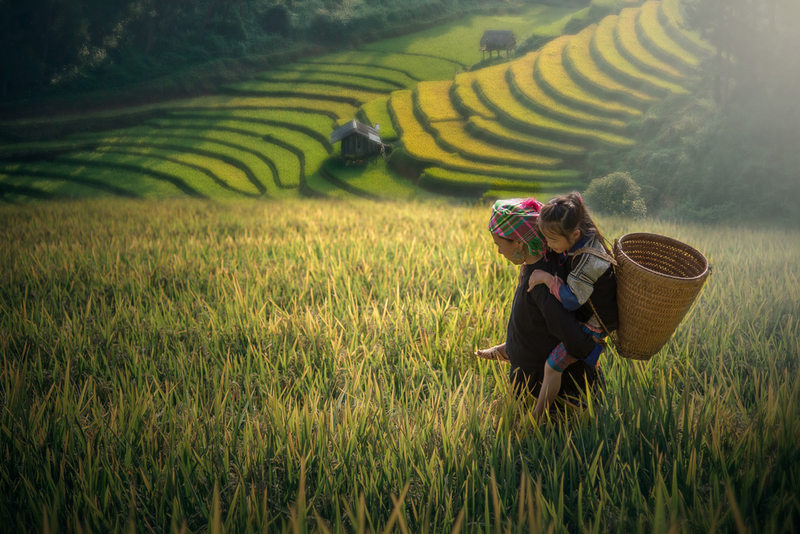 The UN Sustainable Development Goals (SGDs) aim to alleviate global poverty by 2030, and these statistics make it clear that significant progress is required in Sub-Saharan Africa in order to reach this goal. As such, initiatives that positively affect this region are likely to have a greater impact on addressing poverty and achieving the SDGs. Over 25 million refugees globally are living abroad, with 85% of these in developing countries, as of 2017. As a result of the influx of people, many countries are experiencing strains on their resources, as well as political tensions, both of which are affecting economic conditions and trade. 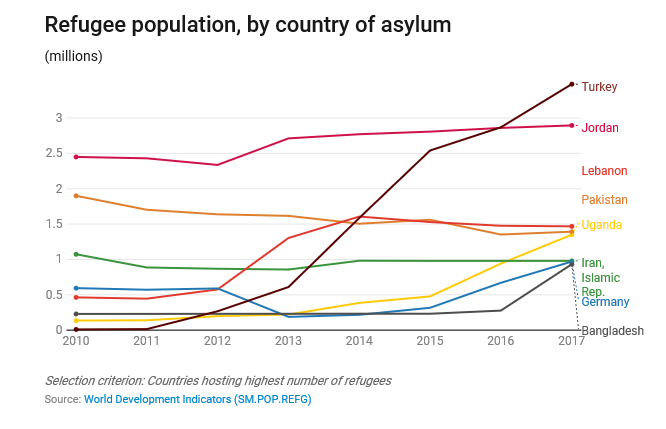 An extreme example is Lebanon, where one in every four members of its population is a Syrian refugee, meaning that it hosts the largest number of refugees per capita in the world. These one billion people make up roughly 13% of the world’s population, and are concentrated in Central and South Asia and Sub-Saharan Africa. Inaccessibility to electricity disproportionally affects those in rural areas, with 87% of those without electricity living rurally. However, much like the reduction in global poverty, significant gains have been made in access to electricity. Since 2010, 40 countries have achieved universal access to electricity. Most notably, between 2010 and 2016, India consistently provided access to electricity to 30 million more people each year. 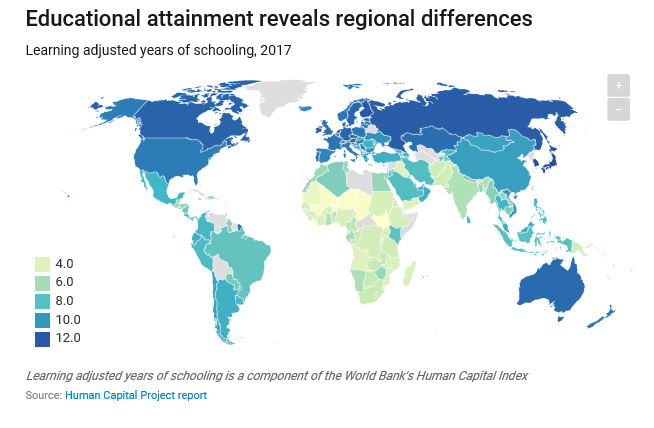 In 2017, the World Bank mapped out the ‘learning-adjusted years of schooling’ across countries globally, showing extreme regional differences. For example, in Finland this value exceeds 12 years, whereas in South Sudan it stands at just over two years, while it is estimated that in lower-income countries, 260 million children and youths are not in school at all. Political instability, violence and poorer health are thought to exacerbate these regional differences. 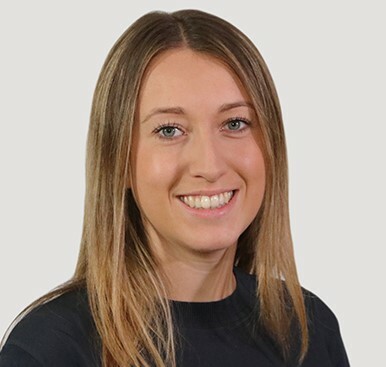 However, as demand for advanced skills increases as some roles are replaced by technology, the importance of education is likely to become even more significant. 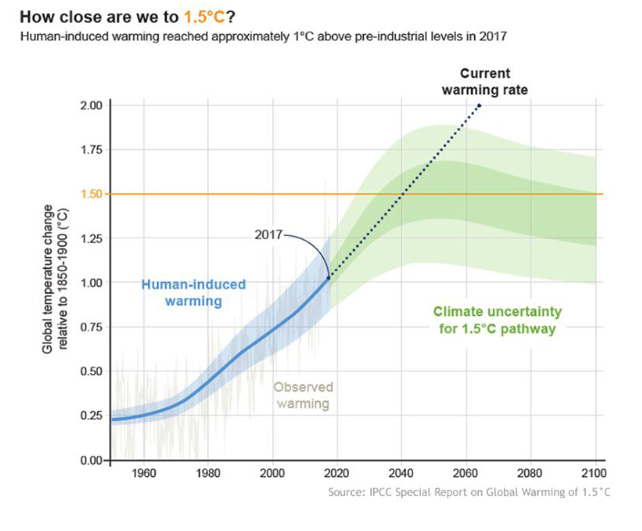 In 2018, the Inter-Governmental Panel on Climate Change published a hard-hitting report, stating that global warming must be kept to just 1.5oC (2.7oF), but that the planet has already warmed by 1oC (1.8oF) since pre-industrial levels. This has prompted a heightened sense of urgency in the need to address climate change. Research by the World Bank suggests that climate change could have a vast impact on both poverty and migration – pushing an additional 100 million people into extreme poverty, and causing 140 million people in Sub-Saharan Africa, South Asia and Latin America to relocate. At Newton, climate change is a key area of focus for our responsible investment team – this has been an engagement priority for some time now, and is likely to remain so for the foreseeable future. In line with this, we have released a Task Force on Climate-related Financial Disclosures (TCFD) report, outlining how we consider climate risks and opportunities that affect our business, as well as our clients’ investments. Air pollution is causing increasing concern owing to the associated health risks. As air quality declines, the risk of strokes, heart disease and lung cancer increases. 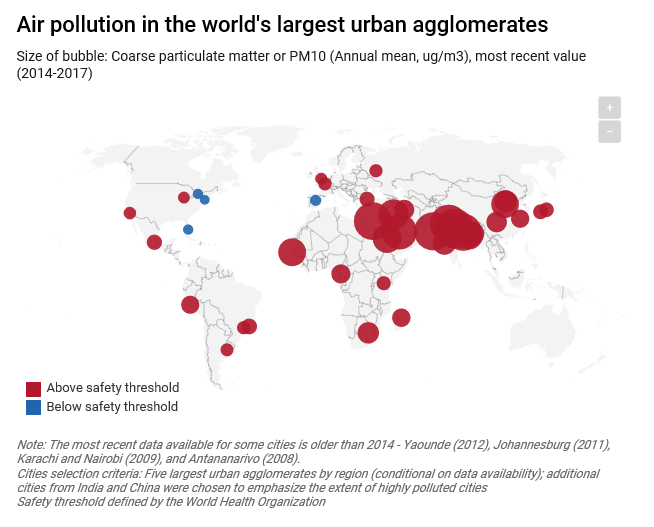 It is estimated that seven million deaths a year occur because of air pollution, disproportionately affecting those in low and middle-income countries. However, poor air pollution also poses a health risk in London, where pollution levels exceed the World Health Organization safety threshold. 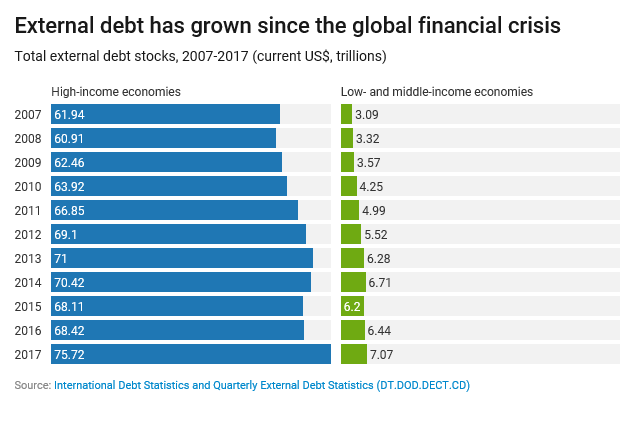 According to International Debt Statistics, borrowing by low and middle-income economies tripled between 2016 and 2017, and levels now stand at over $600 million. Eleven low and middle-income countries also have higher debt levels than gross national income. Overall, this increase in debt, particularly in relation to income, is leading to concerns relating to financial instability and vulnerability. 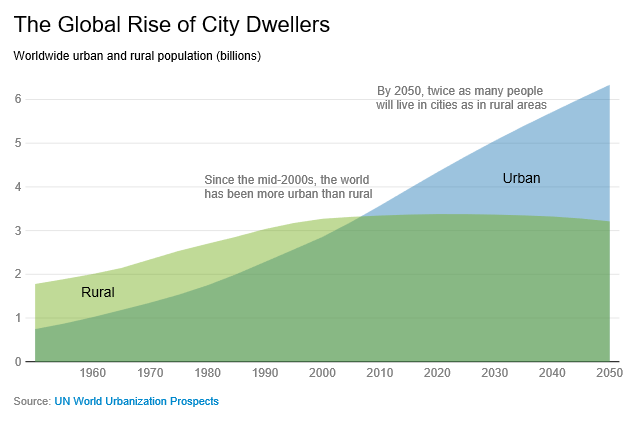 In 1960, just one third of the population lived in a city, but by 2050 it is expected that two-thirds of the population will, representing a significant shift in the movement of the world’s population. 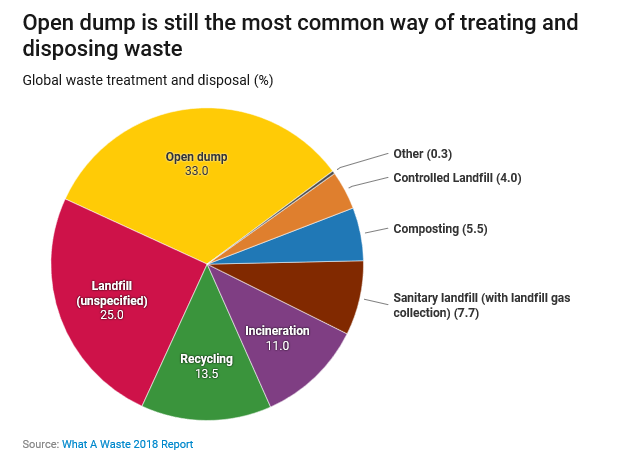 This trend is likely to be even more pronounced in developing countries. In particular, India, China and Nigeria are expected to account for over a third of the global, urban population growth between 2018 and 2050. This urbanization trend is likely to drive the demand for infrastructure, housing and services, and have significant influence on our societies.